When is a TweetUp not just a TweetUp? When it includes baked goods. Thus is the idea behind next Sunday’s SweetUp Orlando. The event is just an informal gathering to get out, meet each other and enjoy some delicious vegan treats. I’ve raved about Babycakes before, and if the word “vegan” makes you nervous, it shouldn’t. Everything I’ve tasted so far gets a thumbs up from the taste buds. SweetUp Orlando takes place February 20 from 1pm to 3pm at Babycakes, which is located inside the Fresh-A-Peel building (next to T-Rex in the Downtown Disney Marketplace). For more information, follow @SweetUpOrlando on Twitter or visit the Facebook page. Vegan and Gluten-Free Baked Goods at Disneyworld? Hello BabyCakes! I first heard of BabyCakes on a Food Network program and I was intrigued, because they offer both gluten-free and vegan baked goods. But I thought I’d have to go to New York City to give it a try. Imagine my surprise when I went with my roommate to check out the new eateries that are now inhabiting the old McDonald’s building at Downtown Disney, and just to the right of the door was a little counter that turned out to be BabyCakes newest outpost. There was no question we would be trying some of the baked goods being offered, but which ones? We started with the case that held the cupcakes. I asked the girl at the counter which was the most popular and she said the gluten-free Red Velvet. So we got that, along with a seasonal Pumpkin flavored cupcake. Both were listed as being agave-sweetened, as it seems BabyCakes also doesn’t use refined sugar. Then we headed over to the other case and decided to do a brownie-off. We bought one brownie bite sweetened with agave, and one sweetened with unrefined sugar. 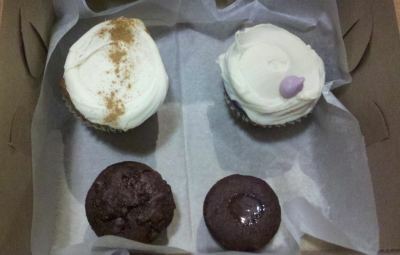 The cupcakes were $3.50 each and the brownie bites were $1.25, so with tax, the four items came to about $10. We found a booth in the back of the seating area and started our tasting. The brownies went first. The unrefined sugar one was larger but a bit dry and it tasted dense. The agave one was smaller, but it was not only moister, it also had a small pool of liquid chocolate on top that ran down when we cut the brownie in half. Out of the two, the agave-sweetened was the bigger hit with us. Next we tried the Red Velvet cupcake. The cake part was really dense, and a little dry, but paired with the frosting, it had a good taste that wasn’t super sweet like a regular red velvet cake. 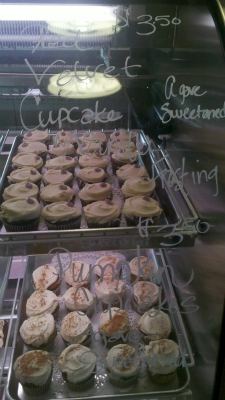 Finally we tried the Pumpkin cupcake. We were both happy that it was saved for last, as it was a big hit with both of us. 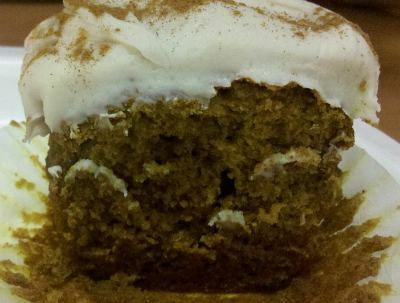 The cake alone was moist and very flavorful, like a pumpkin-infused spice cake. That paired with the frosting tasted just like a mouthful of pumpkin pie. It was so super yummy! 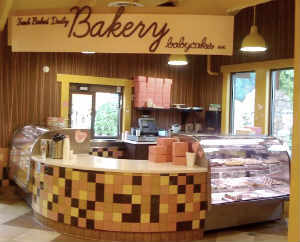 In addition to the cupcakes and brownies, BabyCakes offers other baked goods like donuts, cookies, loaves and crumbs. Lots of goodies to try on a future trip to Downtown Disney. So just to clarify, you’ll find BabyCakes in the building with Pollo Campero and Fresh Apeel (in the Marketplace between T-Rex restaurant and Lego Store). Their hours are 8am until 11pm daily. Want more info? You can call BabyCakes at Downtown Disney at 407-938-9044 and follow them on Twitter @DTDBabyCakesNYC.